Lajamanu School has released new student uniforms in the four Walpiri skin group colours with the designs featuring dreaming stories and animal totems. The design and development of the new uniforms has been a whole-of-community project. 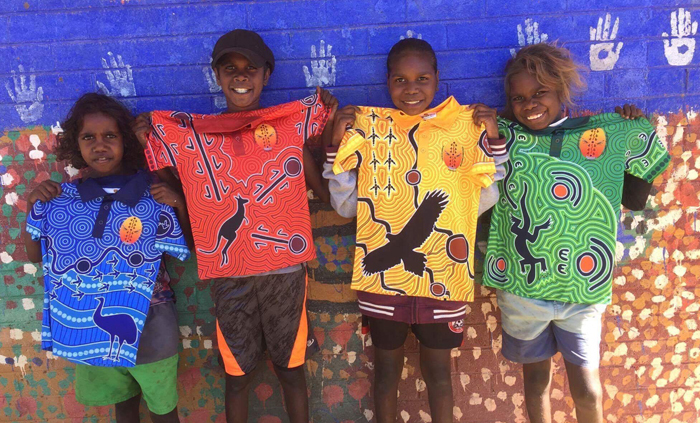 Lajamanu School Principal Juliette Coco said the initial idea for the new uniforms had come from local Aboriginal staff at the school, who then worked with community elders on the design to make sure they were culturally appropriate. “They worked with community elders to find out what pictures and symbols were needed. The designs are part of the dreaming stories that belong to each of the groups and all have the animal totem for that group on them,’’ she said. The yellow design features the eagle, the green uniform the goanna, the blue uniform has an emu and the red design has a kangaroo. Ms Coco said once elders had approved the design concept and symbols, local artist Gerald Watson, painted the t-shirt designs on canvas before they were sent to a designer, who digitised them into files ready for printing. “It’s been a real team effort and they look fantastic. The kids love them and they feel really proud,’’ she said. The uniforms were released to coincide with school photos and a middle year’s school excursion to Cairns. “Everyone in the community wants one, but you have to be a teacher or student to get one,’’ Ms Coco said.